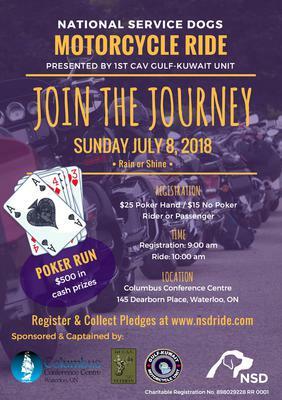 The 13th Annual NSD Ride, will be presented by the 1st Canadian Army Veterans Gulf-Kuwait Unit (CAV) on Sunday July 8, 2018. Registration is at 9 am and kickstands are up at 10 am sharp. The ride will start & end at Columbus Conference Centre 145 Dearborn Place Waterloo Ontario. Your day will begin at the hall with some fresh coffee & snacks. Our photographer will be on hand in the morning to take your picture with our NSD puppies-in-training. This year we will be hosting a poker run with $500 in cash prizes. We have a leisurely route for you to travel to your card stops. Once you have your complete hand, return to the hall for a complimentary BBQ lunch followed by prize giveaways. This also includes prizes for the top pledge earners and puppy sponsorship opportunities. $25 poker hand, $15 no poker hand; includes morning coffee & snacks, pictures with puppies, lunch & great prizes! Raise $100+ in donations & ride for free. Raise $200+ in donations ride for free & receive a NSD Ride t-shirt! Design a personal fund raising page, download the registration form and get further details at www.nsdride.com. Join the Journey! Please help get life-changing service dogs to the people who need them.